A Cozy Riverside Cabin on the bank of the Wenatchee River. The Osprey Nest is a rustic cedar sided cabin -- inside it has an airy open plan with high ceilings and a wall of windows and glass doors that open onto a deck overlooking the beautiful Wenatchee River. It has two open loft bedrooms accessed by a 'ladder' stairway that can be lifted out of the way when not needed. Dogs are not recommended to go up the stairs at this cabin. The river side loft has a Queen bed -- the woods side loft has a Queen bed and two twin size fold-out loveseats. The fold out sofa bed in the living room allows the cabin to accommodate up to eight people tightly- it is best for 2-6 people.. The Osprey Nest offers a fully equipped kitchen, washer, dryer, Jacuzzi jetted bathtub in the bathroom, and a wood stove with glass doors in the living area. The living area has a large TV with basic cable and DVD/VHS player. The cabin is equipped with free Wi-Fi internet access. Outdoor professionally maintained 6 person hot tub on the back deck overlooking the Wenatchee River. From Stevens Pass to Wenatchee you will find your favorite activities. Our location in the middle offers access to everything, whether you're golfing, fishing or rafting on the Wenatchee River, hiking in the Alpine Wilderness Area of the Cascades, rock climbing near Leavenworth, or enjoying a scenic wine tour, you are sure to create wonderful memories. You can wind surf or swim in the clear mountain water of the Wenatchee River or Lake Wenatchee. Please note that the Wenatchee River at the cabins location is closed to fishing, but very nearby is Fish Lake which is an Alpine Lake stocked with trout and a great way to spend an afternoon. In the summer you'll find fruit stands and orchard tours, biking and hiking abound as well. In winter enjoy cross country skiing, downhill skiing, take a sleigh ride or head out into the high country on a snowmobile excursion. There is something for the entire family to enjoy at any time of year! Our family from the Seattle area has enjoyed being owners of the Heaven Can Wait Lodge and Osprey Nest Cabin since the mid 1980’s. Over time we have worked hard to keep the cabin in top shape to be enjoyed by our family and those who stay for vacations often year after year. The Lodge is a very special place filled with many good memories ~ we hope you will chose the Lodge to make special memories of your own! Unparalleled privacy and one of a kind setting on the Wenatchee River. 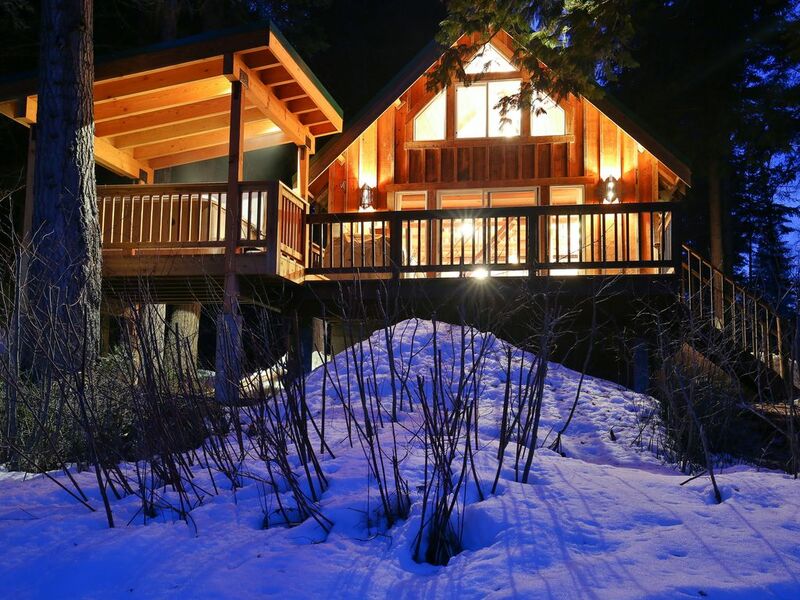 A charming and very private cabin right on the Wenatchee River, a perfect private mountain getaway. Charming tiled bathroom has a large Jetted Jaccuzi Tub for relaxing after exploring the area. Cabin sits on 12 acres on the bank of the Wenatchee River, a very private river setting with summer swimming and year round beauty. Forced air electric heat in the cabin. We provide towels and comfortable bedding including down comforters. Parking for 3-4 cars on site. We provide towels for your use at the cabin. Glass fronted Lopi wood stove in the greatroom; firewood not provided. Comfortable living area with sofa, two chairs and TV Armoir with basic cable. We provide paper filters to fit the coffee maker. Well Equipped kitchen with full size electric range, oven, microwave, toaster, coffee maker, Dishwasher- all that you need to enjoy creating meals at the Nest. Dining table in the kitchen seats 6-8, there is also a round table that seats 4 in the sun room. Large flat screen TV in living room. Some basic classic games are in the cabinet below the TV, we recommend bringing your favorite just in case! There is a large fire ring with seating in the side yard of the cabin, bring a bundle of wood and enjoy smore's and the crackle of an open fire. Rear deck looks out on the Wenatchee River less than 25 feet away, In Summer there is a Dining table with seating for meals overlooking the River, or a quiet coffee; also a 6 person hot tub to enjoy. Just a 30 minute drive to Stevens Pass Ski Area, 8 minutes away in Plain there is cross country skiing and snowshoeing. Professionally maintained 6 person hot tub with view over the Wenatchee River. Extremely private setting on the Wenatchee River, if you are looking for a true getaway in the woods, this is your spot! We had a great time. The place is very quiet and has everything you need for your stay. Would definitely stay again. Very private and comfortable place to stay. We had lots of fun, even when the weather was bad! Great choice and we would will visit again! The place is well maintained, VERY well stocked, clean, has a homey feel, and is in a beautiful location right on the Wenatchee River! We went for our honeymoon from 3/10-3/14. Our first impression was it was so beautiful and exactly what we had dreamed for our trip! The cabin was cozy, and slightly secluded (which we wanted). The inside was gorgeous! We plan to make a return trip in the near future! 10/10 everything was to perfection. Very private adorable cabin, instructions were very clear and it was easy to get in and out of. Awesome (mostly) private cabin in the woods. Great little cabin in a nice secluded area with awesome views of the river from your hot tub. We didn't see another person the whole time we were at the cabin until an hour before checkout when the maintenance guys came and starting taking care of the grounds surrounding the cabin (that has no window coverings). We apologize for the timing of the shoveling service just prior to your departure on Monday Morning; our goal is to keep that scheduled between guests while maintaining the clear decks and steps in and out of the cabin after a snowfall for safety. With service providers having multiple cabins to clear thats not always possible for their schedule. My aplogies that they mis-timed that just before departure Monday, we hope you enjoyed the quiet the previous two days at the Nest and that you will think of us again another time. Holidays & Festival weekends; 3 or more night minimum stay at weekend/holiday rate may be required, please see calendar for minimum stay and rate, or send an enquiry. We accept payments through VRBO. *10% discount on rent for 7 night (or longer) stays; ask for a quote for your specific desired dates.